Tired of schlepping through a soggy mess in your yard every time it rains? Before you can even think about adding an outdoor living space to your home, you are going to have to fix those drainage issues. Consider this: every inch of rain means hundreds of gallons of water penetrating your landscaping, and all of that moisture is going to impact the kind of outdoor living space you can create. Health Hazards: standing water breeds mosquitos, which aren’t just a nuisance when you want to be outside — they pose all kinds of health risks! Landscaping Woes: Soggy ground can make regular lawncare a nightmare. 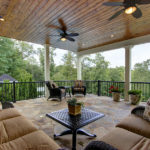 Plants and grass can’t grow in a swamp and adding special features to your outdoor living area can be impossible when the ground remains soggy after a storm. Foundation Erosion: Have you ever thought about the damage all of that standing water is doing to your foundation? Poor drainage is the #1 cause of wet basements, mold and mildew throughout the home and even cracked or damaged foundations. Clogged or Poorly Located Downspouts: clogged, broken and downspouts that fail to divert the water away from your outdoor living area due to improper pitch are all problems that can be easily fixed, and when the water is diverted to other areas of the yard it can help make lawncare maintenance easier; not more difficult. Improper Sloping: if your yard has less than a 3% pitch, the odds are good rainwater is unable to flow away from the house. This can create wet areas where the water is trapped. Impacted Soil: sometimes the soil is to blame for a wet yard. If your lawn maintenance never leaves any natural debris (like fallen leaves) to help moisturize the soil and keep it soft, it can become hard and compact. Rototilling the area or aerating it regularly can help keep soil healthy so that water can flow through it more naturally. The first step to any backyard renovation is making sure the area you’ll be adding that new outdoor living space is free of standing water and wet areas. This can be done in a variety of ways. Here are a few to consider. 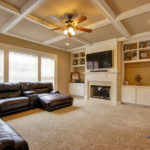 Fix the Slope: If the slope of your yard is sending water towards your home instead of away from it, you may need to do some additional excavation work when building your new outside living area. Begin your construction project by re-sloping the ground away from your foundation so that water is diverted, leaving the area around the house dry. Add a Retaining Wall: Retaining walls aren’t just practical — they can also enhance the look of the entire area. When placed properly, retaining walls can help make your new living area more private; add more seating and give you a place to add a garden or flowerbeds. Install Better Drainage: Proper drainage is critical when it comes to drying out a wet yard. From dry wells, creek beds, to swales and underground drains or pipes, there are plenty of choices available that can work with your landscaping and budget. Build a Rain Garden: Stuck with a low spot that can’t be fixed? Why not create a rain garden. It may not help in drying out the area, but it can make it more useful – and beautiful! Rain gardens are simply areas that collect water and are filled with water-loving plants. Don’t let wet landscaping stop you from building the outdoor living space you have always dreamed of. 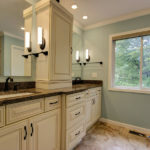 Here at Quality Craftsman, we are Certified Aging In Place Specialists, helping families through the East Cobb area with all of their renovation needs. 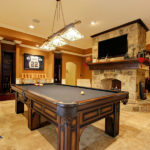 Let our expert crew help you fix your drainage problems and design a space you won’t want to leave. Call today for an appointment!